MANILA - Customized smartphones bearing the caricature image of Special Assistant to the President Christopher Lawrence "Bong" Go went viral on social media Monday after some netizens alleged that they got it from loot bags distributed during a recent meeting of Sangguniang Kabataan officials in Malacañang. 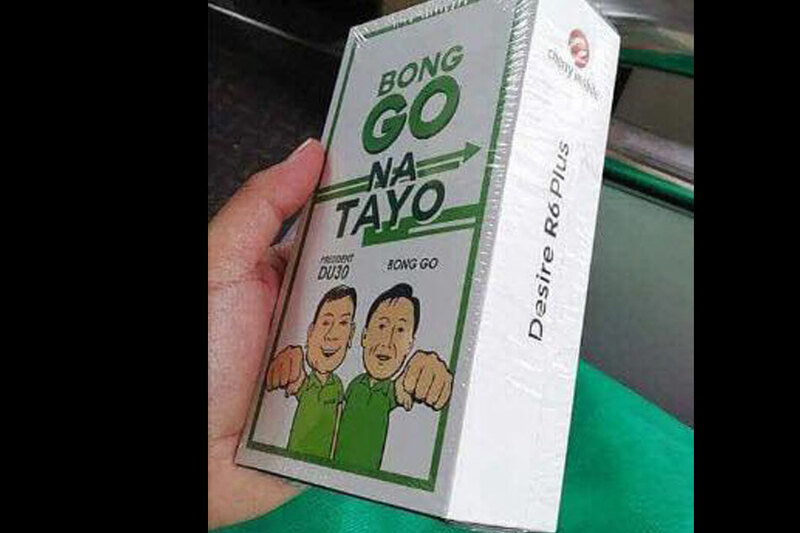 The customized Cherry Mobile Desire R6 Plus was enclosed in a white box that was labelled, "Bong Go na tayo," a catchphrase often used by Go's supporters who supposedly cajole him to run for the 2019 midterm polls. A picture of Go walking alongside President Rodrigo Duterte was emblazoned on the smartphone's back panel, while the gadget's default wallpaper was a picture of the Special Assistant to the President. "'Yang ganiyang model, P3,700 ang market price pero aabot sa P4,000 to P4,500 per unit if customized considering 'yung personalized wallpaper, pati 'yung texture ng back case," a source privy to the production of customized Cherry Mobile smartphones told ABS-CBN News. Go denied any involvement in the production and distribution of customized gadgets bearing his name and face. "Hindi ko alam kung saan nagpapagawa, napupunta, o kung sino-sino ang kanilang binibigyan ng t-shirt, notebooks, relief goods, at kahit cellphones at sapatos," Go told ABS-CBN News in a text message. Go also called on his supporters to stop politicizing donations and souvenirs. "Para po sa mga nagpapamigay nito, salamat po sa pagtulong at pagsuporta pero kung puwede, huwag niyo na po ilagay ang pangalan at mukha ko," Go said. "Huwag niyo na po haluan ng pulitika ang pagtulong kasi hinahaluan lang ng kritiko ng malisya ang kawang-gawa ninyo," he added. This was the second time this month Go had to address rumors of early electioneering. Last week, Duterte's long-time aide drew flak after he used Bong Go-labelled bags in distributing relief goods for fire victims in Manila. Go said the relief goods were a mix of government aid and donations from his friends in the private sector. "May mga kaibigan akong nagdo-donate ng mga sapatos at grocery packs, personal po 'yun [na donation] ng mga kaibigan ko," Go said in an interview on DZMM. "Tuwing nagi-speech po ako sa mga pinupuntahan kong mga nasunugan sinasabi ko po, 'Ipinadala po ako dito ng Pangulo at ito po ay pera ninyo. Hindi po amin ito,'" he said. Earlier this year, Cabinet secretaries and other allies of the Duterte administration launched the "#ReadySetGO" movement to urge go to run for public office in 2019. A recent Social Weather Station survey showed that Go would place 23rd if the 2019 senatorial elections were held between June 15-21, 2018, the time when the survey was conducted.